The entrance to the Stills gallery is unusually blocked by a white screen. It serves to further separate out from in, like the circuitous entrance to a church. This move, from the exhibition makers, accepts that a moment is needed to pause from the quotidian in order to take in the power of Sugimoto’s work. Seascapes arranged in identical format document some of the infinite combinations of water and light. The purity of the images renders them timeless. We may all have a vague awareness of the eras BP and AP (Photography) yet in Sugimoto’s eye these images could be documentary evidence of Noah’s viewpoint as he scanned for Ararat. Place-names are labelled, describing diverse locations, but these can be read as an afterthought, only confirming the universality of the subject. Light has seeped onto the receptive membrane of the paper and left a mark communicating time and acting slowly upon the mind. We are told in the blurb that his craft is highly honed: this feeds a confidence in the monumentality of the work. Walk in off the street to escape from the festival hype for the shock of a spiritual high. Upstairs, replacing the sometime home of the über-tasty Café Odile is an offshoot project from the Japanese/US artist’s work. This is a local project where artists and Edinburghers reflect upon the seaside areas within their reach. Three screens present a slow and witty theatre of the beach. Relax in a deckchair to take it all in. From Cockburn Street it is a short but steep descent via the city link of Craig’s Close to Market Street where you can find more of Sugimoto’s work at the Fruitmarket Gallery. His pine trees mega-photo communicates a less monolithic attitude to the art of photography. A dim impression of a heady early dawn is evoked by a panorama of trees in rich but close greys. The overall piece is wide and flat like a cinema screen but is pieced out of so many boards to achieve length rather than rolled out like a Japanese scroll. This suggests the form of a sliding folding screen, an element in a space rather than one mounted on a surface. The trees become scale-less rather than timeless and could be bonsai as much as redwood, or indeed broccoli. The blurred edges captured by Sugimoto’s method are almost painterly and therefore seamless, giving the work a quality of early Mondrian landscape painting. 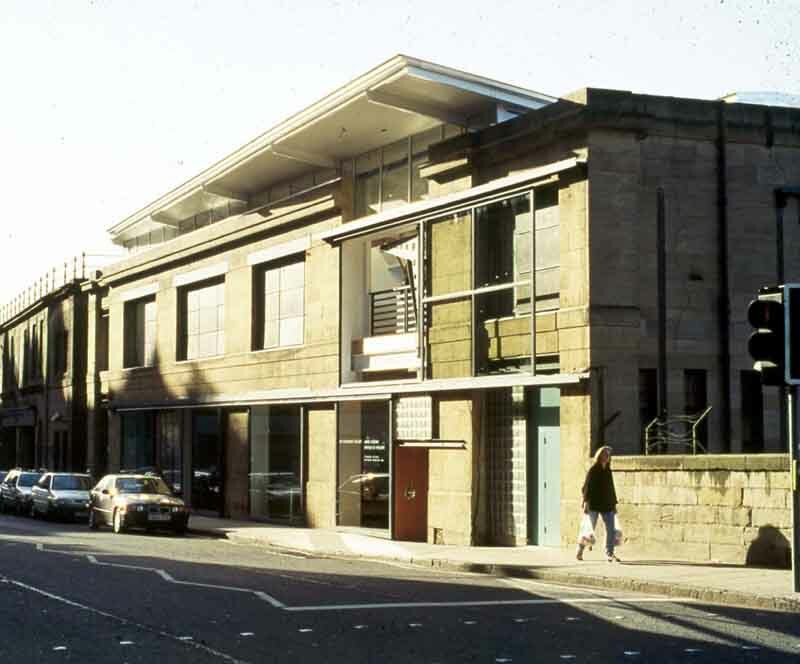 It is upstairs at the Fruitmarket where the show gains its title name. This substantial series of buildings originally stemmed from an unpaid commission from the Los Angeles Museum of Contemporary Art to document Modernist architecture. Architects, take your hats off, otherwise the top floor becomes a game of spot-the-twentieth century-icon. At first glance the pervasive blurred technique shatters an image as if looking at a computer screen at the wrong Hertz. However, Sugimoto’s stated objective is to work back to the origin of the architect’s inspiration, the untested dream. And the method certainly plays some visual tricks. It follows then that the Lloyd Wright Guggenheim comes across here as if still an architectural model. Le Corbusier’s Villa Savoie is, as always, iconic, and seems transformed back to model scale 1:50. Sugimoto sculpts the Italian fascists to an Arabic filigree: the Palazzo della Civita could be in the North African desert, whereas Fumihiko Maki’s Gymnasium could be a galvanised swimming cap. The Seagram building, shot in late 1997, takes on a gained power post “9/11” as it trumps Yamasaki’s work for purity of execution and stands centrally composed therefore resolute in today’s world. Sugimoto reserves his sharpness for his compatriot Ando, the softness of his touch hardly blunting Ando’s clean geometry. It is perhaps for non-architects to judge which forms achieve a convincing monumentality, or for those in the profession to have their favourites shifted into a quite different light.